Hello friends! 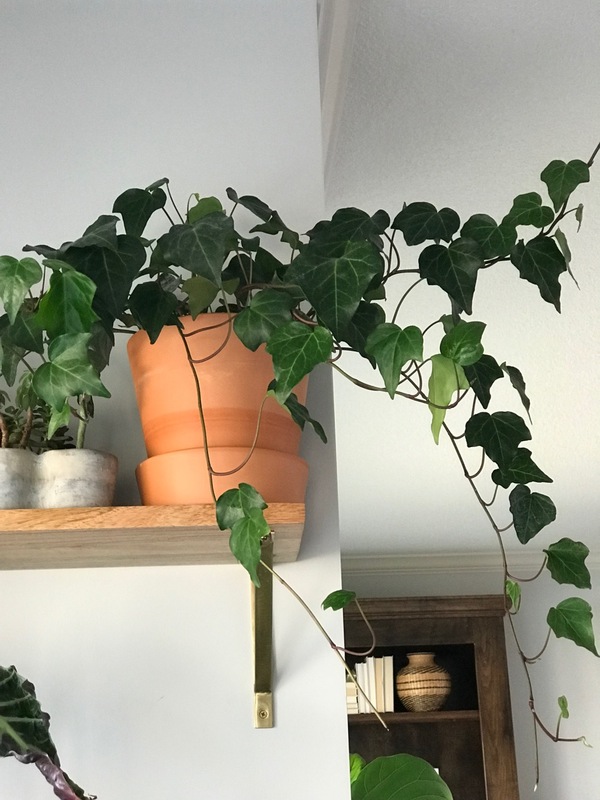 We have a recent addition to our eat-in kitchen nook, and I'm in love! 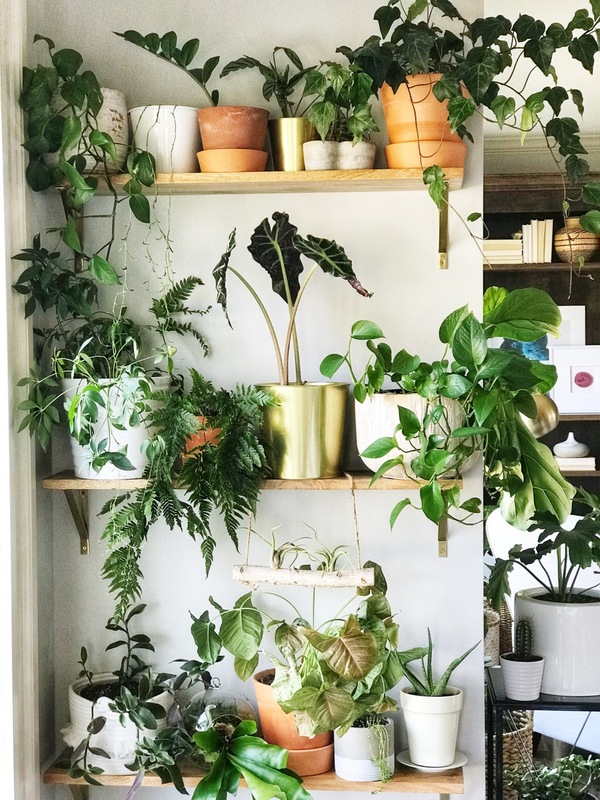 It involves a full wall of plants, which makes this crazy plant lady's heart skip a beat! 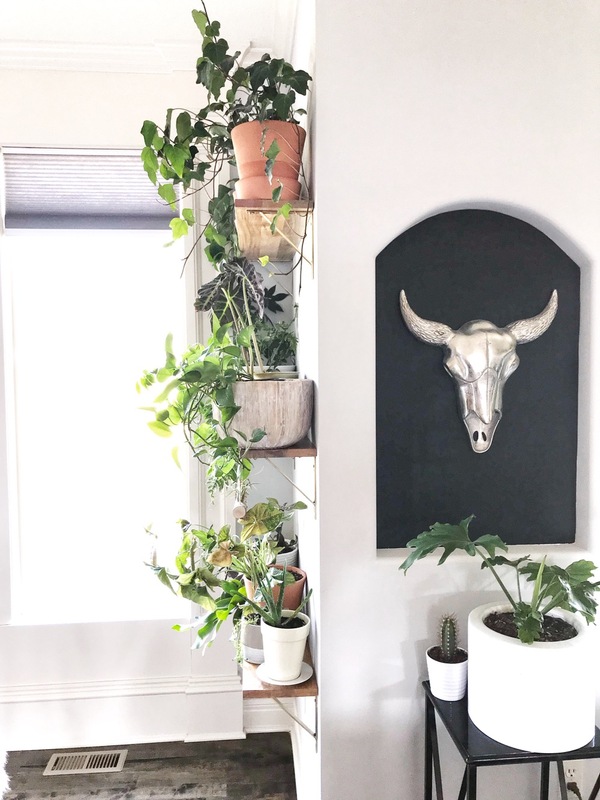 I had been struggling with what to put on this small little wall in the breakfast nook area. The back of the house, adjacent to this wall, is a bank of windows and the other small wall in this space has a large art print that I love. 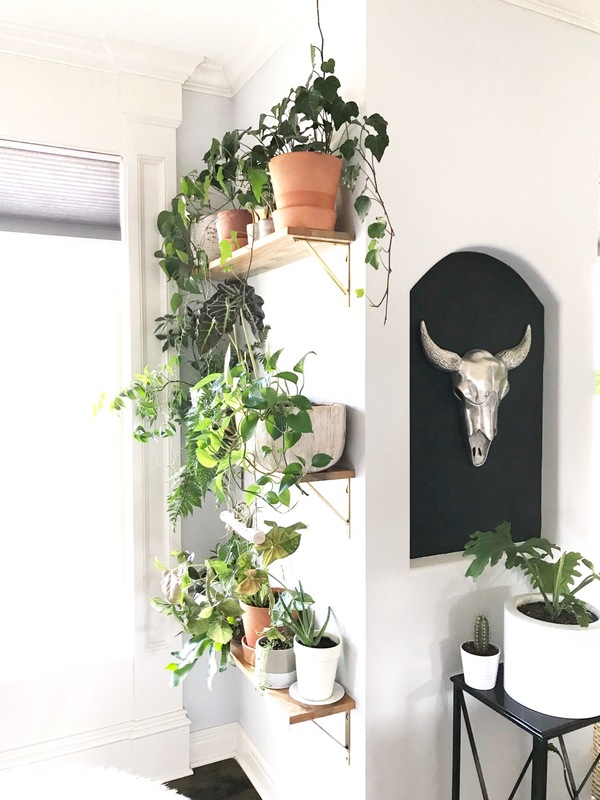 After looking at more and more inspiration photos on Pinterest and Instagram (my favorite place to find inspo), I decided upon a plant wall! Duh! I love a touch of boho in a home. Plants always do the trick! I always have "extra" plants laying around. These shelves help contain all of them and the adjacent bank of windows provides all the wonderful natural light they need. This is a small fraction of all the plants we have in our home, but I love they way they look all clustered together. We measured the wall and did a little shelf research. 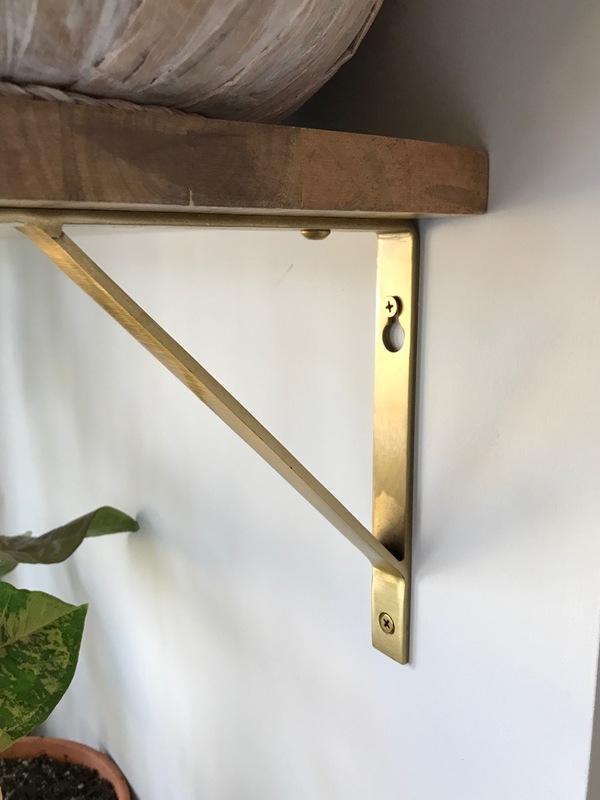 I found these natural wood shelves and the brass brackets at World Market (they are both on sale right now). They fit the wall perfectly, so it seemed meant to be! I love the added warmth the natural wood adds to the space. And the brass brackets help add a touch of glam. We only needed two brackets per shelf, so we ended up with six brackets and three (3 ft. shelves). I made the decision about the direction of the wall, bought the shelves/brackets, and installed them all in the same day. All credit goes to my hubby for seeing out my visions. I have the ideas and do all the styling, but he is the guy who makes it actually happen! I'll never take it for granted that he lets me change things up and is supportive of all of my ideas! The shelves are not super wide, but wide enough to get some larger pots on them. I mixed in small/large plants, hanging plants, cactus, ferns, and different colored pots, keeping it mostly neutral. Anything I can get my hands on basically! I wanted the shelves to be full and overflowing. I think it makes the most impact in the space. So many of these pots are from Ikea. 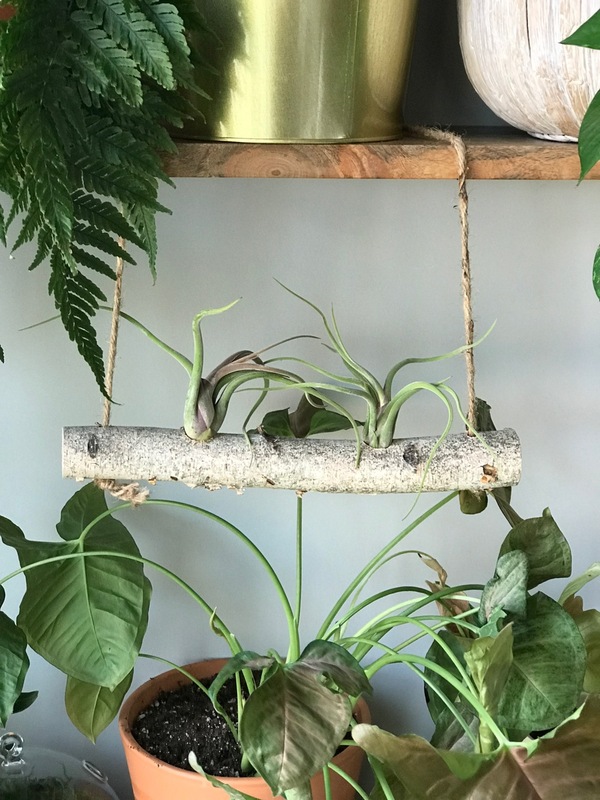 My aunt made me a birch air plant holder recently. 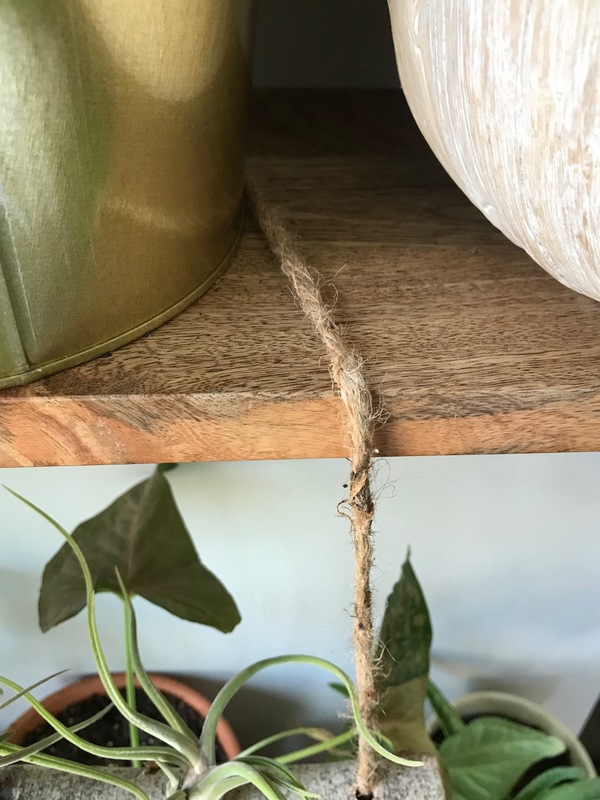 I decided to hang it from the plant shelves to take up space in between the shelves. 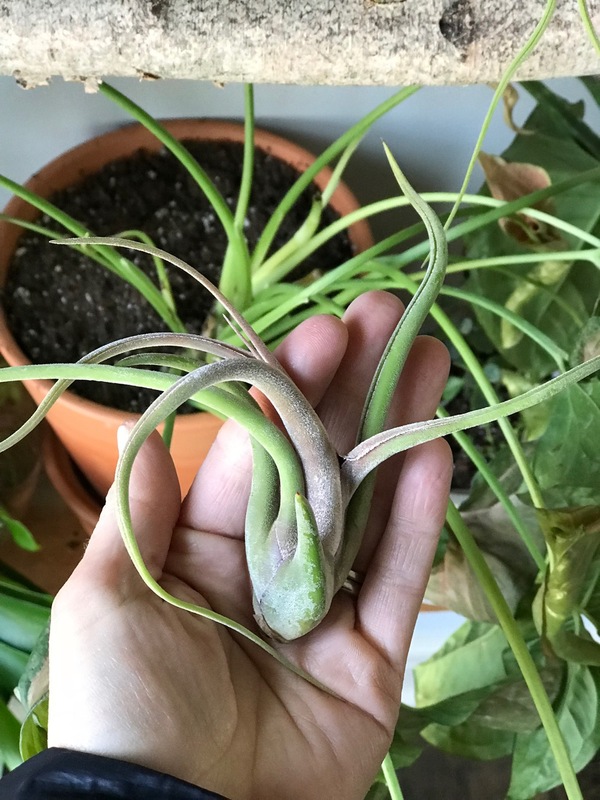 The air plants are from Lowes. I love them. No soil! We keep a stool in our kitchen pantry so the kids can reach up high. I use this same stool to water the plants on the high shelf. 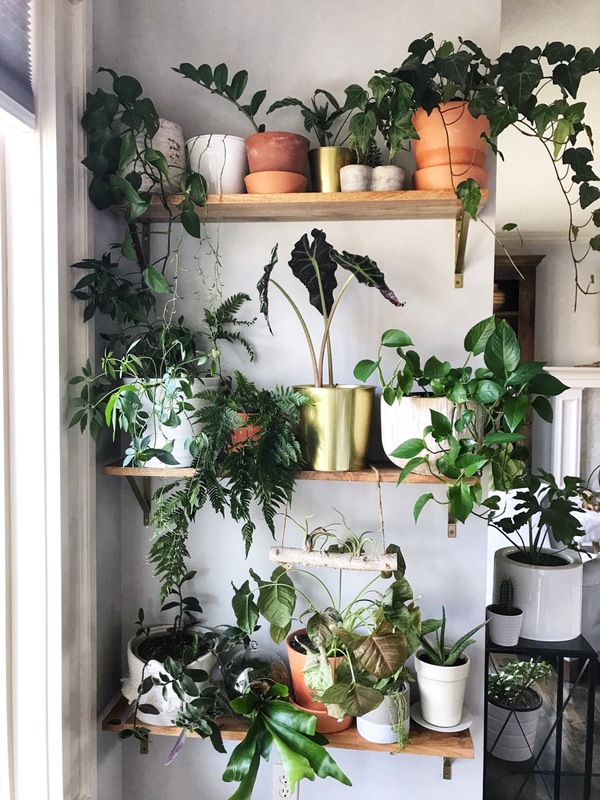 This is the most loved wall in our house! I just love the bold statement it makes. I mostly love being surrounded by plants. 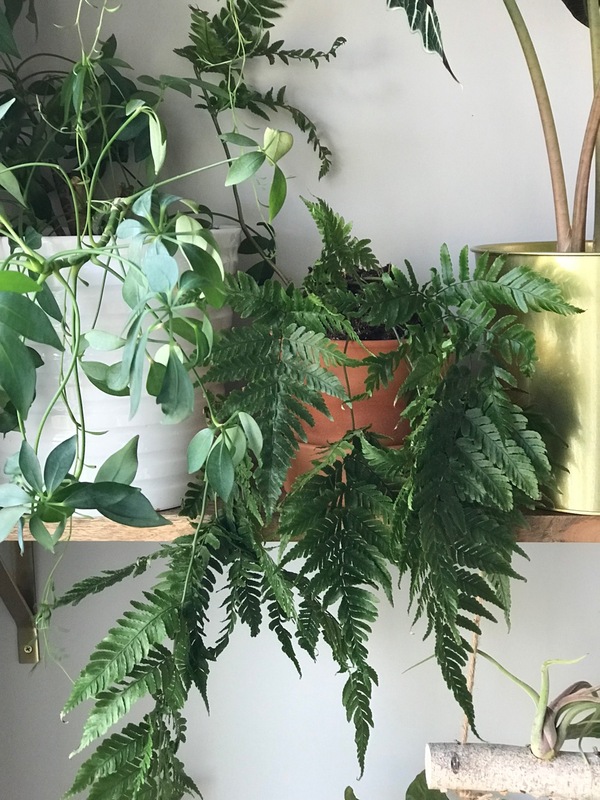 I say that next to my husband and children, plants bring me the most day to day happiness. 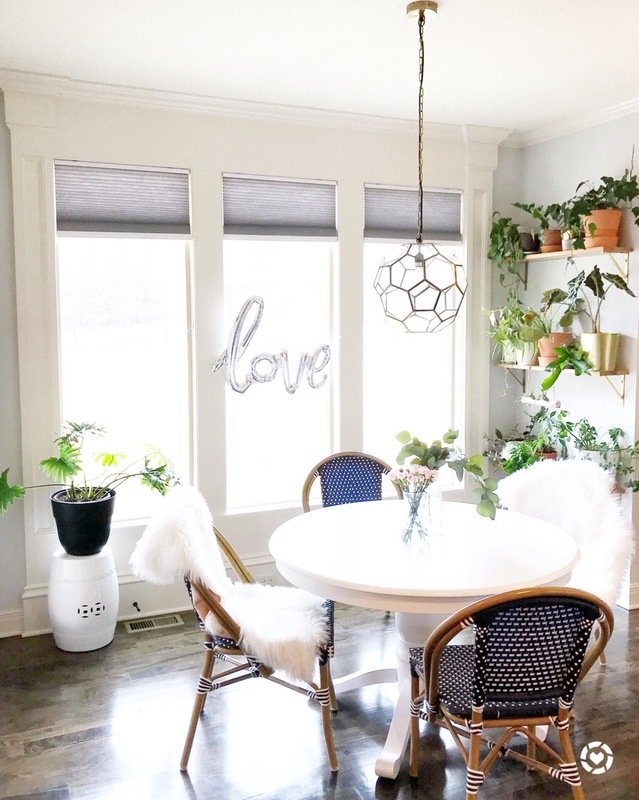 They bring life into a home, literally! 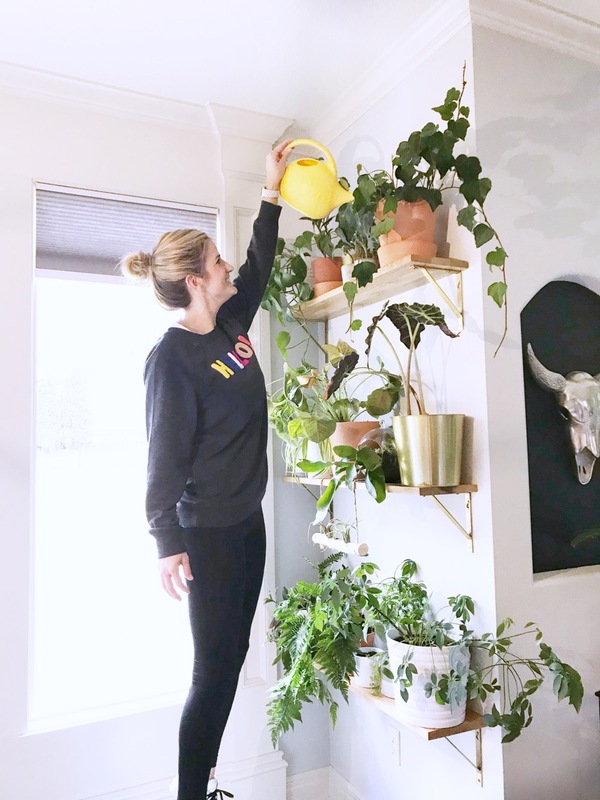 I pick up plants all over...Lowes, Home Depot, Walmart, local nurseries, Ikea. 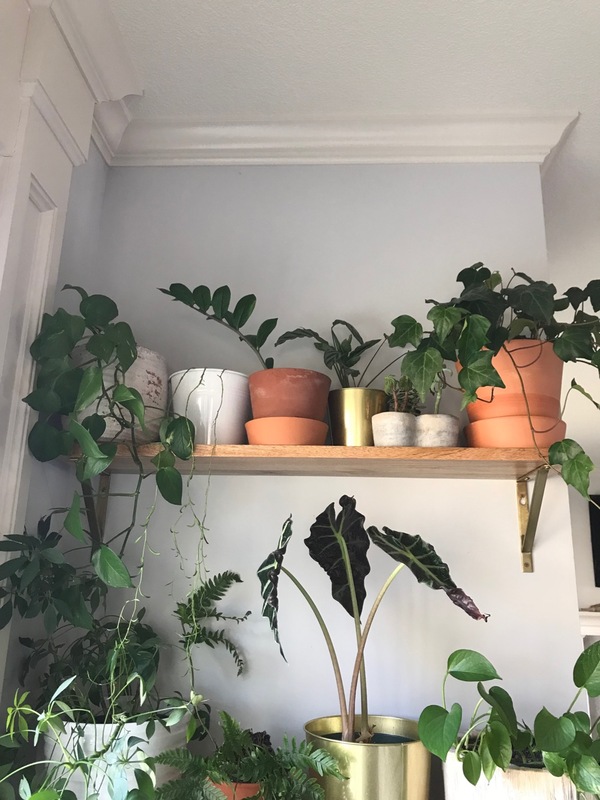 I also propagate and start new plants and this shelf is perfect for housing those working to gain their roots! You can find me most days on Instagram! I'd love to connect! Please send me a message if you have any specific questions about any of these plants!